WE ARE VERY EXCITED TO OFFER THIS SERVICE TO OUR SPA MENU. 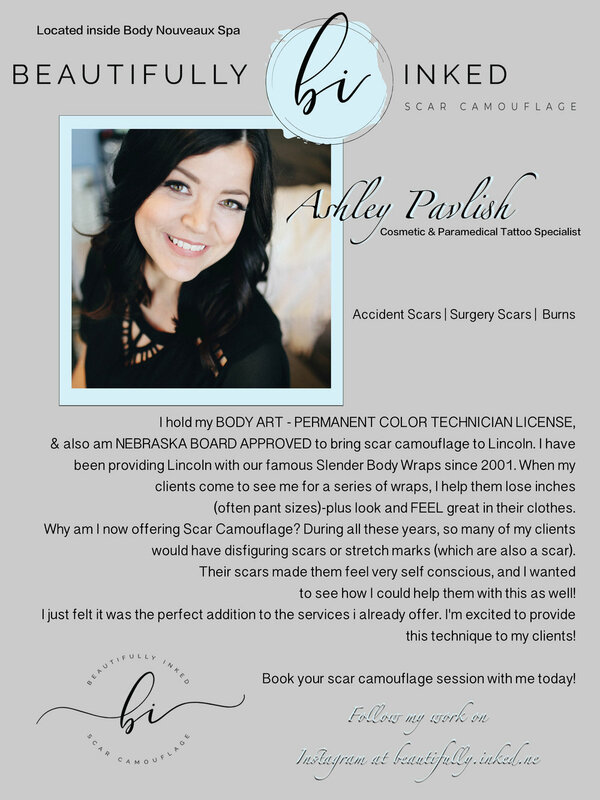 ASHLEY, HOLDS HER BODY ART - PERMANENT COLOR TECHNICIAN LICENSE & IS NEBRASKA BOARD APPROVED to bring scar camouflage to Lincoln. Dry Tattooing / Skin Camouflage: (Uses Tattooing techniques to hide or blend the scars so they are less visible). All scars must be evaluated prior to treatment to determine which course of treatment is recommended, and if you are a candidate for scar therapy. Patch tests for sensitivity and color may be required prior to procedures. The entire basis for this type of Tattooing technique, is to glide the needle groupings across the very surface of the skin to add a light dispersion of flesh tone color to camouflage the blemish. This is not a new service to the market, it was actually invented by tattoo artists over 30 years ago. Scar Camouflage works on the specific areas of affected skin only i.e. each stretch mark or only the scar. Areas that are not affected are not treated. Can be used on all colors of skin, with only dark skins are used with caution as they are prone to hyper-pigmentation. 20-50% improvement can be seen in just ONE SESSION, with a course of 3 treatment recommended for best results. Click our BLOG here for more information on this amazing technique! Camouflage tattooing will not completely restore skin to the way it looked before it was injured. The process will not “erase” a scar or skin abnormality so it appears completely gone and the area looks “perfect” again. It improves color differences to help disguise the scar or anomaly and make it less noticeable to other people. The most suitable scars to treat with micropigmentation are light in colour. Additionally, it is important that the micropigmentation procedure is carried out when the skin is not tanned as the success of the treatment depends on selecting pigments that are close to the natural skin tone. If tanned skin is color matched and the tan fades, the infused pigment will not fade, leaving a noticeable demarcation between the healthy skin and the treated scar tissue. The reverse is also a consideration and you must accept that sun exposure must be minimal once the scar has been camouflaged, as the scar will not tan like the surrounding skin. Camouflage repigmentation is a process, not a one-time “cure”. It is performed on “unhealthy” skin that has been damaged or altered. Its response cannot be predicted—a scar or Vitiligo patch may have areas that absorb pigment, reject it, or both. The area will look dark and red immediately after a tattooing session, and then it takes several weeks to show the healed color (or not). This requires time and patience.